My Texas Bucket List began taking shape shortly after we arrived in College Station. At first the list consisted of only a few touristy day trips and experiences (think Six Flags, Sea World, etc.) I'd thought of or heard about prior to our move. But as we made new friends, especially new friends who grew up in Texas, we learned from them about the lesser-known - at least to Midwesterners - but not-to-miss sights and sounds of the Lone Star State. 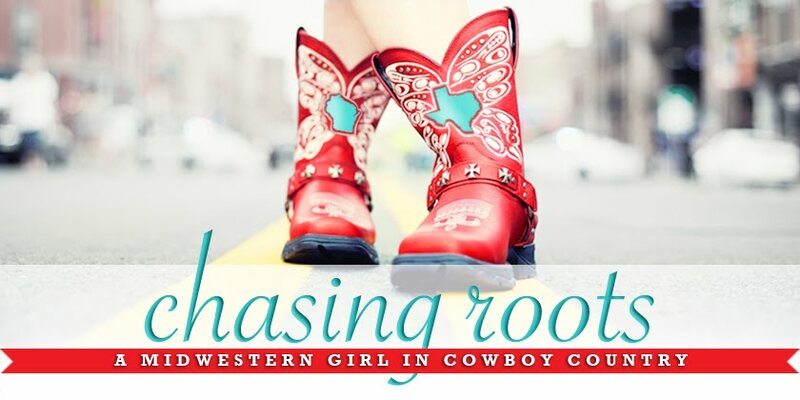 You can see my full - but ever-growing - Texas Bucket List here. Feel free to let me know what I'm missing! We've taken two- and three-day vacations to both Houston and San Antonio, and while I know visitors can't possibly see and do everything these cities have to offer in such a short period of time, we did our best to fit in as much as our young children would allow us to given their ages and temperaments at the time of each trip. I imagine we will eventually circle back around to these cities to catch more of their tourist destinations and local hotspots, but our Texas Bucket List requires us to hit the rest of Texas' big cities first. 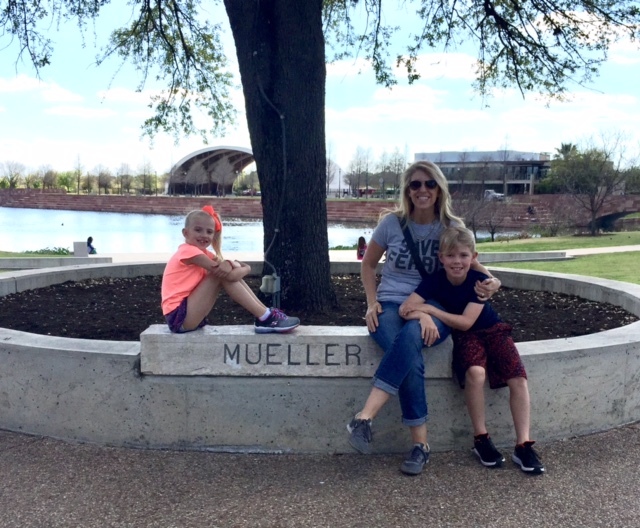 Over spring break, we headed to Austin for a whirlwind tour of just a few of the city's highlights. After stopping in Caldwell for breakfast - kolaches for Tom, Will, and me and a sugar cookie (not a battle we fight while on vacation) for Hallie - we spent a few hours brushing up on our Texas history at the Bullock Texas State History Museum. We enjoyed the many exhibits, artifacts, and galleries and loved the museum's multi-sensory film, Shipwrecked, which tells the true story of the sinking of La Belle, "the ship that changed history". landmarks, as each one is worth classroom cash at school. definition hologram of what the ship would have looked like. Texas star outside the museum. After the museum we toured the inside of and walked the grounds around the Texas State Capitol. While the exterior architecture and grounds didn't disappoint, the chaos of the workday made it difficult to appreciate the interior architecture and the business taking place; the common areas were crowded, hot, and stuffy and everyone with whom we interacted had woken up on the wrong side of the bed. We didn't stay long. Outside the Texas State Capitol. After the Capitol we headed to Mueller Lake Park and Community Night at Austin's children's museum, The Thinkery. The kids enjoyed snow cones, playing on the playground at the park, and visiting all of the museum's exhibits. the Mueller Lake, Mueller Park, and Mueller Town Center signs. We all found this touch-sensitive light board somewhat hypnotic. different kinds of skin cells using microscopes. We finished out the day with mexican food and an NCAA basketball tournament watching party in our hotel room. been "walled off" behind a six-foot fence and in dire need of restoration. going off that diving board off my Texas Bucket List! Enjoying the park's "Splash" exhibit. serenaded us as we rode by on the train. Will wading in the water at Campbell's Hole. ...Hallie fell in up to her waist and elbows. severely pulled hamstring, so I couldn't join them. We had lunch at a cool food truck park, and then headed downtown to check out South by Southwest. We weren't quite sure what to expect having never attended this conglomeration of festivals and conferences, and we found ourselves surprised at how "rough" a crowd we encountered on a Thursday afternoon. Despite the PG-13 people and language Tom and I saw and heard (nearly all of which went right over Will and Hallie's heads), both Tom and I appreciated the diversity showcased in this kind of environment as well as the opportunity to show our kids that the real world looks quite a bit different than what they regularly encounter in College Station. 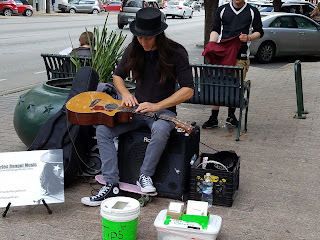 6th Street in downtown Austin. Checking out the Pandora tent at SXSW. 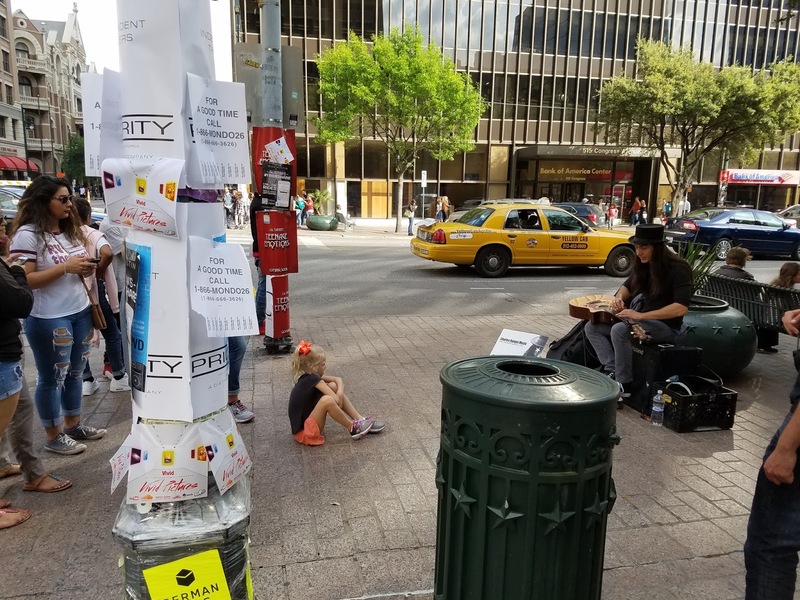 One of our favorite street musicians. Our absolute favorite part of SXSW came in the form of a street musician named Charles Rangel. 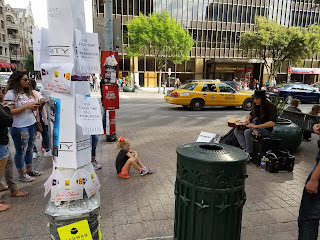 He played tap guitar, and when we passed by him the first time we stayed for 10 minutes and made a donation so we could pick up one of his CDs. Two hours later we circled back around and stayed for another 30 minutes. Other people came and went, but Will and Hallie literally couldn't look away. He was incredible - check out the video below! We wrapped up our 6th Street adventure with frozen yogurt and smoothies from Berry, Hut's famous onion rings (which didn't impress us as we'd hoped), and a late night pizza party back at our hotel. The kids didn't quite get Berry's sign. been hungry enough at the time to try their hamburgers! On our way home we stopped at the Dinosaur Park in Cedar Creek, just a few miles outside of Austin. The kids truly enjoyed the outdoor museum, and I'm so glad we visited now, rather than in even just a couple of years when I imagine Will might have out grown this kind of destination. Hallie in particular enjoyed acting scared whenever an opportunity presented itself. stop at McDonald's for breakfast, to name a few.